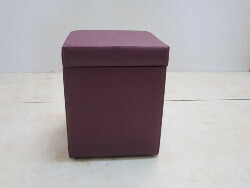 Pioneers in the industry, we offer storage ottoman from India. We are a trusted name in the industry for manufacturing, wholesaling and retailing Ottoman Storage. The offered machine is made in compliance with the international standards and is regarded for its durability. This machine is resistant to corrosion, abrasion and wear and tear. It is user friendly and is used for packaging in food processing, electrical, cosmetic and stationary industries. Looking for Ottoman Storage ?